- 11 years, 6 mos. Once again I had the pleasure of enjoying another private selection of Four Roses Single Barrel, this time going with the OBSF recipe. I purchased this quite some time ago, but only recently got around to popping the bottle open. I'm not really sure why I waited this long. My only excuse is that I had other bottles waiting to be opened as well, and I knew it'd be opened eventually. 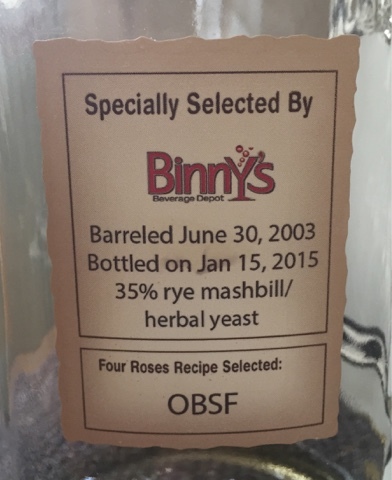 This recipe is a 35% rye mashbill, and it was very noticeable even on the nose. This bourbon has some wonderful, familiar scents of cinnamon, vanilla and a slight hint of orange. It was a very nice bouquet of smells, and it had me salivating for that first sip. At 118 proof, it definitely had a strong burn to it, which was seemed to be made even stronger by the heavy cinnamon flavors that dominated on the front end. The rye spice dominates throughout, making this bourbon less sweet than the norm and a bit more on the peppery side. There was also a very distinct cherry flavor that permeated as well. It wasn't until the back end of each drink that the more traditional vanilla and toffee flavors really came through, but they stuck around and lingered at the back of the throat after each swallow. They weren't strong, just strong enough to be noticed. While the burn came through initially, it did die down a bit toward the end. As it did, the more earthy, herbal flavors came to the foreground, pushing the sweeter flavors even more into the background. What once had rough edges due to the burn cooled down significantly into a smooth, easy to drink bourbon, even if it wasn't as sweet as most.